Welcome to the website of Paul Steel Electrical Contractors Ltd, specialists in domestic, commercial and industrial electrical services. Based in Wakefield, we are ideally located to cover all areas of Leeds, Wakefield, Wetherby and surrounding areas. We are your ideal electrical contractors: we consistently deliver on time, to the highest quality and at the most competitive prices. Celebrating 25 years of trading this year! 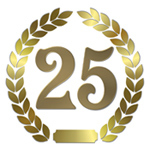 We are proud to be celebrating 25 years of trading this year. Established in 1986, we have provided people in the West Yorkshire area with the highest quality electrical services. We have numerous clients and over the years have had literally hundreds of satisfied customers! For a list of some of the past and present clients worked for, please click here. We pride ourselves in the quality of our work, and we hope that you will see from our website the type and standard of work we are capable of. As a customer, your complete satisfaction is our highest priority. Please contact us, if you have any questions about any aspect of our work. We are qualified to City & Guilds standard. We hold the City & Guilds 17th Edition (2382-10) and Inspection and Testing (2391-10) certificates, having passed both qualifications. You can have complete peace of mind about the safety and standard of your electrical work carried out through us. We are ELECSA Part P Approved Contractors. This means that we have been formally assessed and found competent to perform electrical work under Part P of the building regulations. It shows that we adhere to certain standards and comply with all relevant legislation. We can cover all areas of Leeds, Wakefield, Wetherby and surrounding areas. If you live outside of these areas, please contact us and we will do our best to help. 17th Edition Exam and Kewtech specialists.